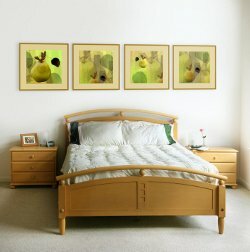 Organic Mattress - What are the Advantages? An organic mattress is made with all-natural materials, which are non-toxic and free from harmful chemicals and synthetic materials. They are breathable and keep you cool in the summer and warm in the winter. When it comes to mattresses, an organic choice is preferred for individuals who suffer from allergies, asthma, and other respiratory problems. In addition, organically made mattresses are healthy for babies and young children. Mattresses that are certified organic are usually made from a mixture of layers of natural wool and/or organic cotton, along with natural organic latex. Although more expensive than traditional spring/foam mattresses, they are comparable in price to the popular memory-foam mattresses that are on the market. The natural latex/wool combination is usually the most expensive option, whereas an organic cotton/spring design would be at the lower end of the price scale. For allergy sufferers, an all-natural mattress that carries the 'Greenguard Environmental Institute' certification is a plus, as that means it's been designed to meet indoor air quality and low emission standards. Chemical free - not treated with dangerous fire-retardant chemicals. They, aren't made from synthetic polyurethane, which is a well-known allergy trigger, etc. Here are some of the drawbacks associated with these mattresses. According to Joyce Robertson of Arkansas-based Mountain Air Organic Beds (mountainairorganicbeds.com), natural latex mattresses have among the longest life spans of any mattress type, with the exception of mattresses made of horsehair. The durability and longevity of foam mattresses are directly proportionate to the density. The denser the foam the longer the mattress will last. For example, Ms. Robertson noted that Polyurethane foam is 1.9 pounds in density. Tempur-pedic foam is 5.3 pounds in density. And in sharp contrast, an all-natural Dunlop latex rubber mattress is 40 pounds in density. "The difference in density between other mattresses and an organic latex mattress can be compared to the difference between the texture of angel food cake and pound cake," she explains. The intense density of natural latex mattresses enables them to remain comfortable and last for 40 or 50 years, in some cases. Yet, synthetic or blended latex mattresses break down quicker and lose support because they use fillers. 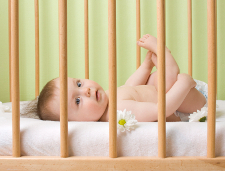 Why Choose An Organic Crib Mattress? An organic crib mattress is a healthy, safe, and clean choice for your baby. With an organic crib mattress, there are no dangerous chemicals or other man-made additives to worry about. The materials are naturally free of dust-mites and mold, which minimizes allergy symptoms or other sensitivities arising. For any mattress you choose, do your research and insist on 100% organic materials. Not all "eco-friendly" or "green" mattresses are created equal. All components and the manufacturing process need to be non-toxic and the mattress shouldn't contain materials such as phosphorus, boric acid, antimony, arsenic, polyurethane foam or plastics. A mattress that has the words, "certified organic," on it should meet your needs.